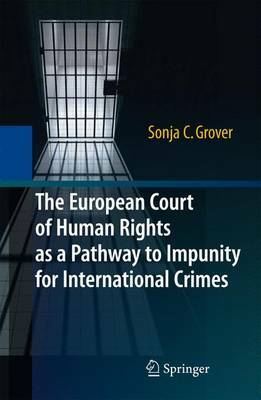 European Court of Human Rights as a Pathway to Impunity for International Crimes 2010 ed. Introductory Remarks on the Perspective and Intent of the Author in Writing This Monograph The European Court of Human Rights comments in the judgment Korbely v. Hungary that: However, clearly drafted a legal provision may be, in any system of law, including criminal law, there is an inevitable element of judicial interpretation. There will always be a need for elucidation of doubtful points and for adaptation to changing circumstances. Indeed, in the Convention States, the progressive development of the criminal law through judicial law making is a well-entrenched and necessary part of legal tradition...The Court's role is con?ned to ascertaining whether the effects of such an interpretation [ interpretation by the national courts and authorities of domestic law which sometimes may refer to or incor- rate international law principles or agreements] are compatible with the Convention 1 [ European Convention on Human Rights and Fundamental Freedoms] (emphasis added). This book then examines to what degree this "inevitable element of judicial interpretation" has been applied by the European Court of Human Rights in a manner consistent with the guarantees of the most fundamental human rights under international criminal, human rights and humanitarian law. I: Selected Factors Facilitating Impunity for International Crimes Through the European Court of Human Rights.- II: The European Court of Human Rights' Reluctance to Classify European Convention Violations as International Crimes Even When Those Violations Likely Constitute `Genocide' or `Crimes Against Humanity' in Times of Peace or in Immediate Post-conflict Periods.- III: The European Court of Human Rights' Reluctance to Classify European Convention Violations as International Crimes Even When Those Violations Likely Constitute `War Crimes' or `Crimes Against Humanity in Times of Armed Conflict'.- IV: The Importance of Moral Legitimacy in International Human Rights Court Rulings. Sonja C. Grover, Ph.D., is a Professor with Lakehead University, Canada. She has authored 7 books and over 80 refereed articles; over 60 on the topic of human rights published in leading international human rights and law journals, has presented numerous international conference papers and published book chapters in this field. She has also written several books on children's human rights including, "Children's Human Rights: Challenging Global Barriers to the Child Liberation Movement" (2007); "The Child's Right to Legal Standing" (2008) and a major reference book, "Prosecuting International Crimes and Human Rights Abuses Committed Against Children: Leading International Court Cases" (2009).